March is Women’s History Month, and it is appropriate to read, discuss, and reflect on the contributions by working-class women in the struggle for a better society. For those parents who want to teach our children about the history of the working class, there is a new young adult novel that presents the role that women and children have played in American labor history. Bread and Roses, Too, by Katherine Paterson, is set in the historic Lawrence, Massachusetts strike of 1912. This historic class battle involved tens of thousands of workers, largely women from numerous ethnic groups speaking many different languages. Bread and Roses, Too focuses on the experience of two adolescents during the strike. Jake Beale, a child worker at one of the mills, lives on the streets to avoid his abusive father. Rosa Serutti, who takes pride in her “American” education, is the daughter of an Italian immigrant woman. Both children can see the greed and injustice of the bosses but are not politically educated to see the importance of the need for the strike and the union, the Industrial Workers of the World (IWW), in order to win better wages and working conditions for the textile workers. About three-quarters of the textile workers (approximately 48,000) were immigrants and lived on less than $9 per week – the mill owners had gone out of their way to recruit immigrant families from overseas. These job opportunities were an incentive to migrate for poor women in Southern and Eastern Europe looking to help the family purse, but mostly they provided cheap labor for the bosses. As a result, the mills brought together women workers from different cultures who formed a mighty battalion against the mill bosses’ attempts to break the strike of 1912. The women’s solidarity and willingness to fight secured for the strikers favorable publicity across the country and helped them organize for their children to leave Lawrence in the bitter winter. Jake and Rosa meet throughout the novel and arrive in Barre, Vermont as part of a contingent of children of the Lawrence strikers. 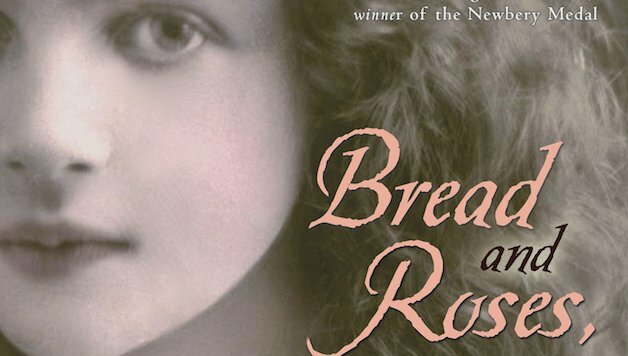 Like most young adult fiction, Bread and Roses, Too relates the ups and down of young adult life, yet it never becomes fixated on the personal feelings of Jake and Rosa. Paterson weaves all the famous events of the 1912 Lawrence strike into her story of the two adolescents so that, through them, the reader experiences the events and labor figures that marked that historic strike. Nevertheless, the political analysis of the events of the Lawrence strike stops short of saying that the root cause of the textile bosses’ inhumane treatment of workers is capitalism. For instance, Jake wants to run away to New York City so he can make it on his own (a reflection of a belief in an individual’s ability to overcome capitalism). One character, Mr. Gerbati, a “socialist,” has his own business in which he employs workers. Unlike Rosa’s mother, Mrs. Gerbati does not feel the double burden of work in the factory and in the home, and she most definitely doesn’t worry about starving like the immigrant women workers in Lawrence. The words “socialism” and “Marxist” appear in the story but are never fully explained to the reader. It doesn’t help that the people using these words are Miss Finch, a teacher and supporter of the textile bosses, and Jake, who are either hostile or indifferent to the strike, respectively. In reality, socialists and Marxists like “Big” Bill Haywood played a hugely important role in leading the successful strike and organizing the women workers of Lawrence. Despite these shortcomings, Paterson’s Bread and Roses, Too is well worth reading for teens (and adults) interested in the role of women in labor history. 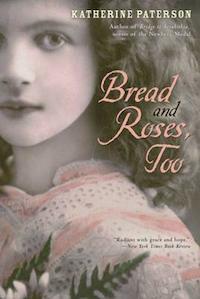 Bread and Roses, Too by Katherine Paterson. New York: Clarion Books, 2006.